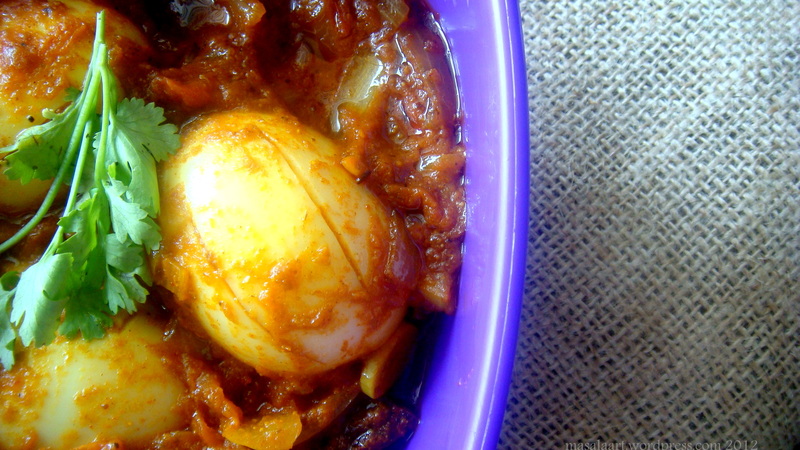 Egg Masala: Simple, Spicy And Speedy. Two weeks ago for my What I Ate Wednesday post I posted a picture of egg masala. 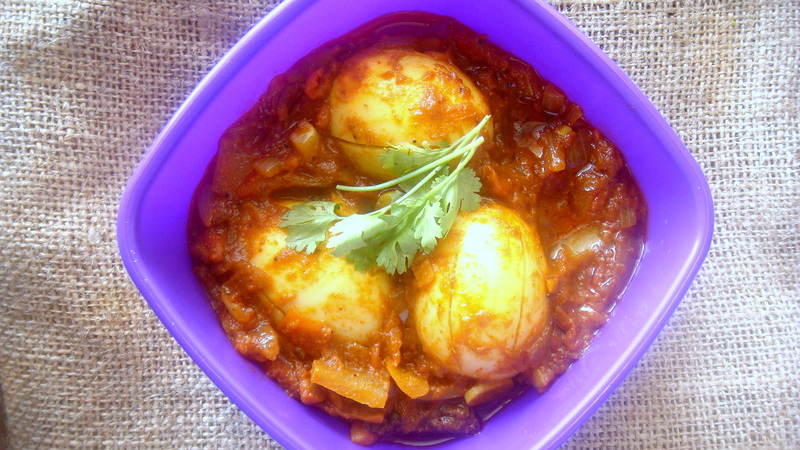 Egg masala is one of my all-time favourite dishes from home, and it is my go-to recipe when I want something spicy, something quick and when I am too lazy to make lentils or marinate meat. Especially when one’s spouse will eat vegetarian food for only 2 days in a row and then begin to make a face. I always have eggs in stock…but how many omelettes can one eat? How many frittatas can one prepare? Sometimes, you just gotta have the curry. The masala. The desi raison d’etre. And this works wonderfully. At home, we always refer to it as ‘mutta roast’ or egg roast, mostly because my grandmom would boil the eggs, and then fry them lightly in spiced oil so that the sides would turn a little brown and crisp. Then, she would remove it from the wok, make the gravy and add the eggs in again once the masala was cooked. This adds a lovely little crunch…think of it as crackling from an egg. And if you ever travel through Kerala and stop at a highway diner or restaurant for breakfast, you can be rest assured that ‘mutta roast’ or ‘mutta curry’ will be on the menu. And you can safely order it, because it is a very rare Malayali dhaba that can screw up a mutta roast. I mean really. You have to be particularly devoid of knife skills and flavour sense to bungle this one up. Boil the eggs, peel and keep aside. Make some slits along the flesh of the egg with the tip of a knife- this helps the masala seep in. In a bowl, mix together the coriander powder, chilli powder, cumin powder, turmeric powder with a little water to make a smooth paste. In a wok, add 2 tbsp of oil. 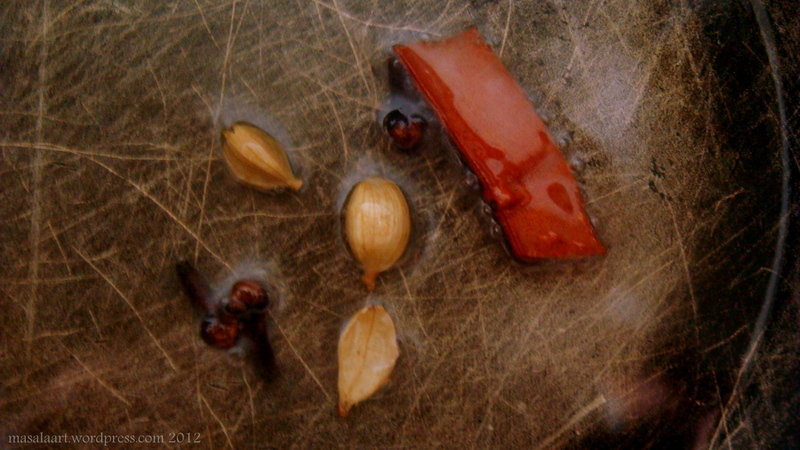 When the oil becomes hot, add the whole spices- a small stick of cinnamon, 3 cardamom pods, 3 cloves. Fry gently taking care not to burn. 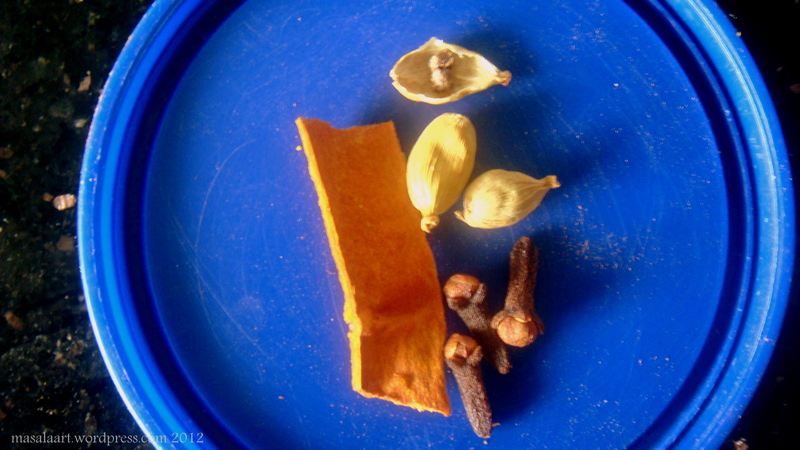 The idea is to release the essential oils of the sweet spices into the oil. Now add the masala paste and fry over gentle heat till oil separates. Add the chopped onions, tomato, garlic, and saute gently till mixture becomes soft. Once the masala begins to come together, add 2 tablespoons of tomato puree and cook some more. At this stage, add in the 1 teaspoon of sugar, as well as salt to taste. Add the boiled eggs at this stage, and just saute gently till the eggs are coated with the masala. Before serving throw in curry leaves, and garnish with fresh cilantro. 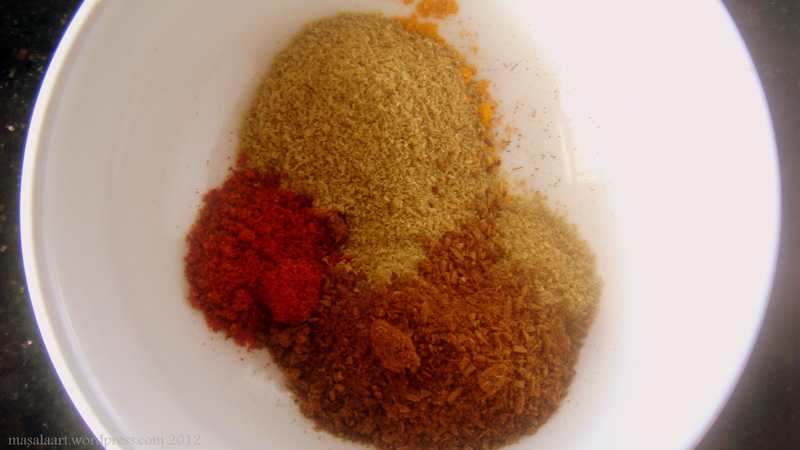 Whole spices are actually so beautiful to look at and inhale…cinnamon is my favourite scent of all! Like I really needed to put that in. You know these are powdered spices. Oh well. My bloggy crutch. Un oeuf- a little bumpy, this one. I think cilantro is pretty. What about you? ♥Substitute the boiled eggs with cottage cheese or tofu to make a vegetarian/vegan version? ♥ Use chunks or strips of chicken instead of boild eggs? 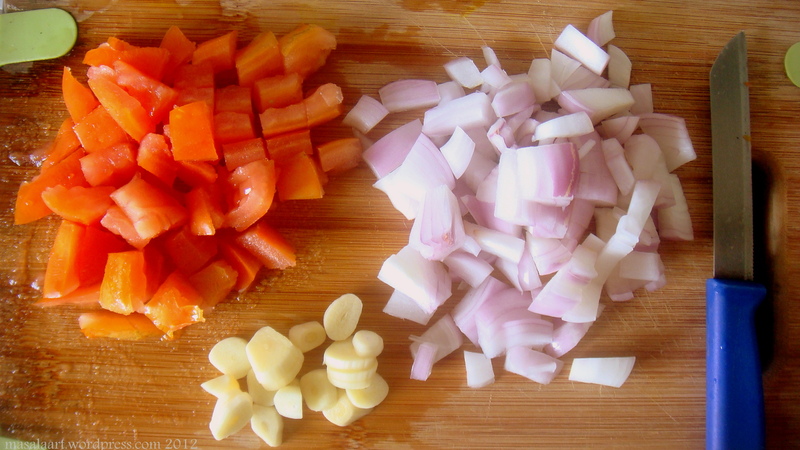 ♥ Throw in some freshly minced ginger along with the onions, tomatoes and garlic for added flavour? This is so unique i love it! Going out for indian food is my favorite treat because it’s something I wouldn’t make at home. But this seems like a good way to try! What a delicious sounding dish! And I love that you can change up the protein so easily. Thanks so much! Yeah this masala can be used for anything really…even potatoes and peas! I think this is a fantastic veggie dish and comfort food! My family would want this for sure! Oh yay! And the good thing is, you can have it with anything from rice to bread. Oh you should! Amazing appam, puttu-kadala, pathiri etc. yum yum and more yum…. I love Cilantro, too! I think it’s a pretty herb that tastes divine! One of my favorites. And your Egg Masala looks really satisfying! Mmmm. I have to do this next time I make chicken tikka. I used to sometimes throw boiled eggs into my Thai curries, too. Happy WIAW! Thanks a lot Sawsan!! I love the aroma whole spices bring to curries- so much nicer than powdered! My kind of food 🙂 I love egg masala, and we often have it in winter, I’m not sure why but somehow it’s very comforting to eat. Lovely recipe ! It is, isn’t it? I guess it could be considered Indian comfort food…like mash or something! I always think of dal as comfort food 🙂 But mash, well that’s special comfort food !! That looks so yummy. And I have lots and lots of eggs. Can’t wait to try it! Thanks Michelle! And I’ll bet the eggs you get there are much nicer too. When I visit my parents home in Kerala we get farm fresh home grown eggs from a place next door. Unfortunately in Mumbai, I don’t know where exactly the eggs come from. I am lusting after Egg Masala now! Glad it makes you feel that way! It is easy, so you can hop over to the anda-wallah and get started. Thanks so much for visiting, vaish! Are the eggs hard boiled or are they still runny inside? Oh I forgot to mention that! 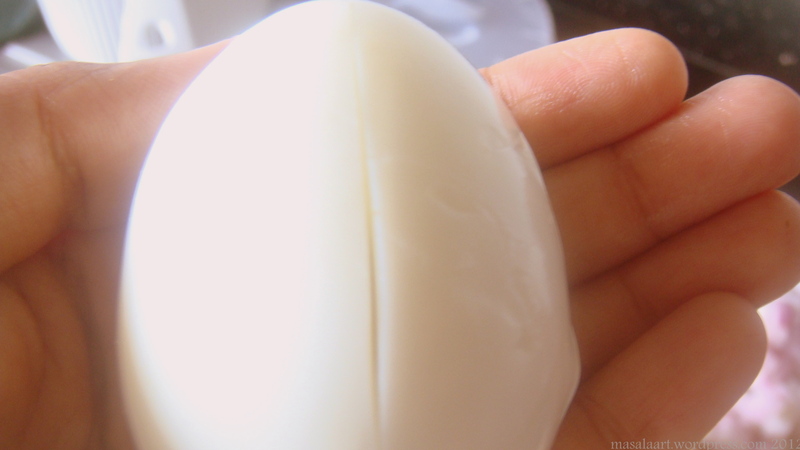 I hard boiled them, but you could keep them runny inside if you prefer. Wow, this combines two of my favorite things: Eggs and curry. Will be making this as soon as possible! This looks wonderful and simple. Mmmmmmmmmmm. Yum.